Actually, I should have said, "Life is Great in the Adirondacks!" As usual, all it takes is a little time away from these lovely mountains to remind me how beautiful it is here. I was away this past weekend and arrived home last night to vibrantly colored leaves, a clear, starry sky and awesome fresh, clean air. If you've read this blog before you'll know I write about what it is like to live in the Adirondack Mountains of New York State. I rave a lot about how gorgeous it is - the natural beauty is extraordinary and the Adirondack Lifestyle makes some people feel good. On that point, the Adirondack Fall Wildflowers are putting on quite a show. And trail running this time of year is superb. 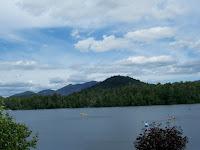 Today's photo shows Mirror Lake, in Lake Placid as summer winds down in the Adirondacks.